Looking for climbing ropes? Check out our Buyers Guide! Not only do rope bags facilitate the transportation of long ropes on uneven flats, they also protect the coat of the rope from dirt and abrasion. There is a wide range of great rope accessories. Here, you can therefore find some tips in order to make it easier for you to choose. Rope bags are made of extremely abrasion proof material (usually Nylon), which enables you to transport and put down the ropes securely. In some models, even the outer material is coated and therefore, extremely weatherproof. You will not find a rope bag that will be comfortable to carry without a wide, padded belt. However, if you like carrying your rope bag on your back, you should go for a backpack design with to padded shoulder straps. This is especially recommendable when used on boulders with a difficult or long approach. There are rope bags which are designed very simple and primarily serve the protective function. Better designs come with small organizer pockets. This facilitates the storage of accessories if you only have a rope bag with you. Keys, tape and cereal bar will find enough space in here. Another important point to bear in mind is the manner of packing: Usually, every climber more or less has his own way of packing the rope without tangles or knots. Therefore, the shape of rope bags can be either long and narrow (tubular) or rather round. It all depends on your personal preference and whether you like to fold, or stuff the rope into your bag. While stuff sack and rope underlay are usually stitched together, there are also models which combine both of them individually and separately. This enables you to easily carry the rope in a removable and robust tarpaulin without being irritated by the other part of the rope bag dangling around. In order to avoid the annoying search for bare rope ends in your rope bag, you should always look for colored rope end loops. If you like to carry only a single bag, then you are very well served with a rope bag. Thanks to their size it wont be necessary to take another bag for belts, shoes, quickdraws or other climbing accessories. 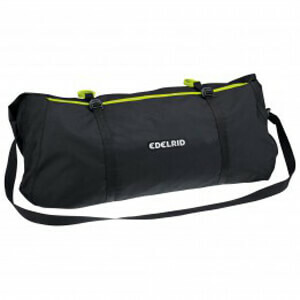 For heavy load a rope bag which has backpack straps and good padding on belts is recommended. If everything, except the rope is carried in a backpack anyway, you should opt for a shoulder bag in order to keep your hands empty for the approach. Obviously there is enough room for a long single (70m) or two shorter half ropes (50m) in every rope bag that is good.